Speedy, quiet and does not take up too much room when paper feeder tray and exit tray are folded away. Set up was very straight forward. 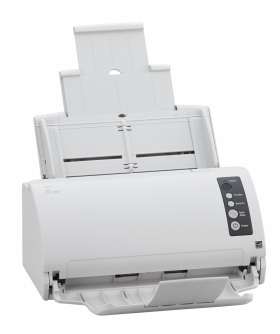 On screen, the user interface is provided by PaperStream Capture 1.5, a newly developed high performance document capture application that enables the fi-7030 to serve as an out-of-the-box document capture solution. PaperStream Capture is easy to operate because it features a simplified user interface similar to those of mobile apps optimised for touch screens. First time users will appreciate its intuitiveness. PaperStream Capture is based on the concept of “One Click Capture”, reducing the required number of screen touches or clicks. It effectively streamlines repetitive operations, preventing operational errors. Where business critical document related processes require a higher level of user interaction, PaperStream Capture 1.5 conveniently provides information listings and step-by-step workflows.